Ever wait for a product so long you felt it could never live up to your expectations? That’s how I felt when I finally received my Anvanda Bag in the mail, nearly a year after I supported the campaign through Kickstarter. My Timbuk2 messenger bag was showing its age, and I’d been lugging the poor guy around since I received it as a gift more than five years ago. It’s not that I’ve solely used the Timbuk2—no—I’ve tried plenty of other bags. But after constant disappointment with loose stitching, crappy zippers, and shoddy materials, I always came back to the Timbuk2. The Anvanda Bag seemed just too good to be true. Anvanda claims to deliver a high-quality bag for a reasonable price, which is what originally drew me to the project. So I waited and waited, and my bag finally came in the mail a few weeks ago. Was it worth the wait? The Anvanda Bag is simply the best bag I’ve ever used as a daily carry. The bag itself is sturdy, well constructed, and made of high quality materials. This backpack messenger hybrid can be carried in almost any way imaginable. The bag has several strap clips and can be set up to be carried like a backpack, messenger back, or by the handle like a briefcase (although not sure why you’d do this). No matter what angle from which you approach it, it’s easy to grab the bag and get going. I purchased the smaller green version of the bag with a leather upgrade. Much to my delight, I unzipped the bag for the first time to discover the inside lining was bright orange. The brown/green exterior gives the bag a classic professorly look, but the orange interior livens things up a bit. Much like my favorite pen addict, orange is also my favorite color. Pockets! This bag has just the right amount of pockets. I keep my Nock Co. Tallulah in a hidden pocket, easily accessible and tucked behind the front leather panel. The bag doesn’t go crazy with battery packs, bungee cords, robotic arms, or any of those other extras you see on a lot of the newfangled Kickstarter bags—and I prefer the bag for it. The Anvanda Bag does include a rain cover, which is easy to slide around the bag and tucks into a dedicated pocket at the bottom of the bag. Sturdy snaps, clips, and zippers make this bag something special. Nearly every component of the Avanda Bag feels custom. The zippers are sturdy, have handy keychain snaps, and are stamped with Anvanda’s logo. While many bag manufacturers source supplies from bargain basement suppliers, which becomes clear when zippers break within a week, Anvanda seems to have done their research, and the bag shines because of it. My few issues with the Anvanda Bag are minuscule. 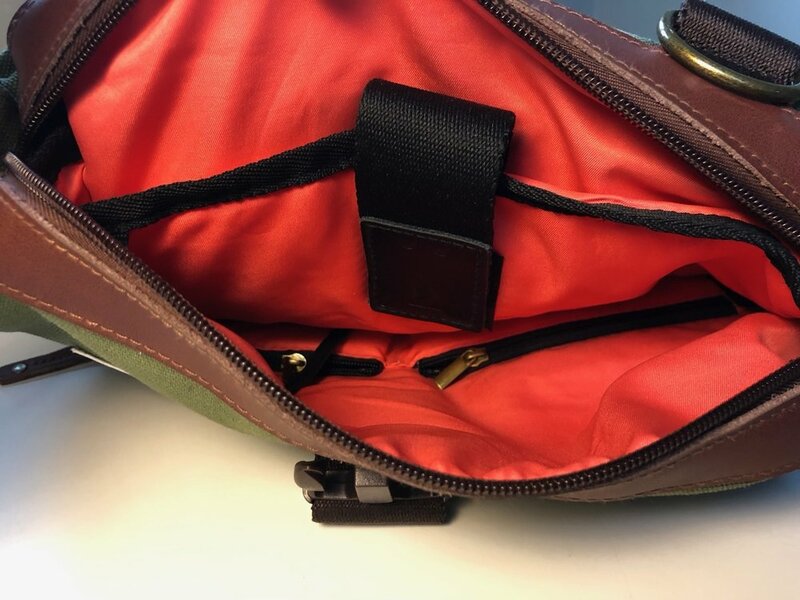 The laptop sleave is accessible when unzipping the bag in backpack mode but not when unzipping from the messenger bag style zipper. This is a minor annoyance, and I’m not even sure how this could be manufactured in a reliable way without resulting in a flimsy insecure laptop sleave. There’s no access to the laptop sleeve in messenger bag mode, but there is another secret pocket! For the first time in five years, I’ve finally found a new bag that’s worthy of everyday carry status. 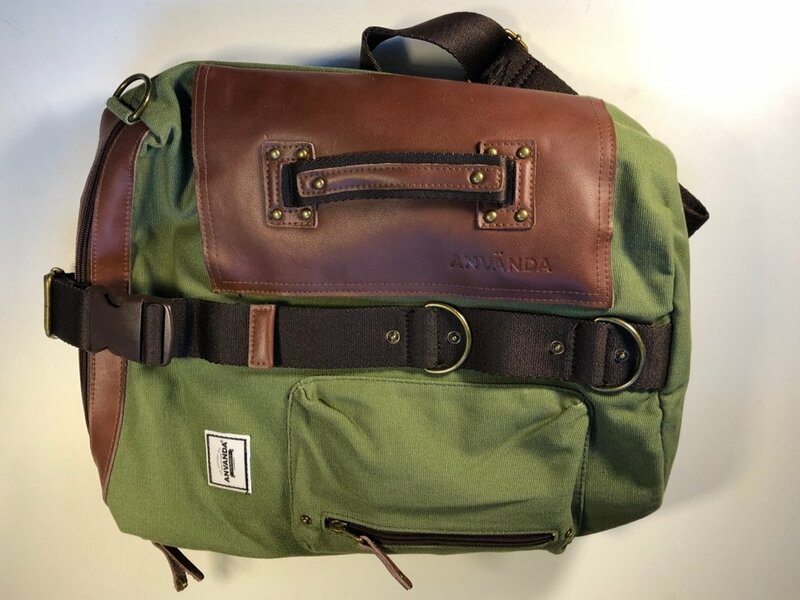 I’ve been carrying the Anvanda Bag exclusively for the last few weeks and, dare I say, I like it more than my old Timbuk2. Capacity wise, I often find myself lugging around my 13-inch MacBook Pro, 12.9 iPad Pro, and a folder stuffed with paper, and the Anvanda doesn’t flinch. It’s just big enough without feeling bulky. There are very few products that live up to the hype of clever marketing techniques, but the Anvanda team has pulled off something special here. The bag is truly phenomenal and worthy of a glowing recommendation. If you’re looking for a durable bag that can be carried in several modes, the Anvanda may very well be worth a look. It’s currently available and shipping via Indiegogo. The Nock Co. Sinclair has been my go to case for years. It offers plenty of storage for pens and index cards and has lived in my work messenger back for some time. Although it’s a smaller case, sometimes one or two pens is enough, and I don’t need the extra room for stationery. I’ve never been a fan of those compact pen pouches, where the pens roll around freely, commingling with nothing between them. It’s fine for cheap pens, but I couldn’t stand to think about my Lamy 2000 or Pilot Vanishing Point getting scratches or chips from rolling around in a pen pouch. Nock Co.’s Tallulah offers an elegant solution to this problem, providing a compact form factor for my most cherished carry pens. I received my Tallulah as a reward from the Pen Addict Live Kickstarter, and it’s been my primary pen case ever since. The case has two large pen slots which can handle larger pens like the TWSBI Go and those of standard size. Compact clip-less pens get lost at the bottom of the pocket, but this is common with most cases. The case also has a pocket for business cards, although I have used it to stash one or two extra pens, which it does well. There’s enough slack in the case to store four or five pens total with relative ease, unless they’re big guys. Keep in mind that pens stored in the business card pocket may rub together, so it’s probably best to reserve this for less expensive/delicate pens. Those familiar with Nock Co. cases will find the same high quality design and construction in the Tallulah. The stitching holds up well under continuous use, and the case’s zipper is still going strong after hundreds of zips and unzips. As an orange fanatic, I love the clay/sunshine colorway. The outer case is a copper tone that’s much more subdued than my mandarin Sinclair, and I prefer it. The inner yellow is bright and cheery and the colors have stayed true despite constant usage. The Tallulah is another fantastic addition to the Nock Co. line of cases. It’s also more than that, though. I’ve spent a lot of time on this blog exploring the fussy, finicky, and inconvenient—things fun to use but never practical on the go or as daily drivers. You may have noticed the lack of posts since August, and I have to be honest—my life has been complete chaos as of late. Amidst terminal illness (don’t worry—not me), hospital visits, and holiday travels, I appreciate the tools I can throw into a bag at a moment’s notice. The flexibility and compactness of the Tallulah makes it invaluable. My Lamy 2000 and Retro 51, along with a few business cards, live inside at all times. I can throw the Tallulah in a bag with a notebook and my iPad and work from anywhere. It’s this simplicity that has allowed me to continue to get things done amidst the chaos. TWSBI is known for producing some of the best bang-for-your-buck pens on the market. The TWSBI 580AL fountain pen was my first “fancy” pen purchase (read-greater than $20), and it’s still the best value pen in my collection. TWSBI recently introduced the TWSBI GO fountain pen at its least expensive price point yet. How does it compare to its more expensive counterparts? Read on to find out. 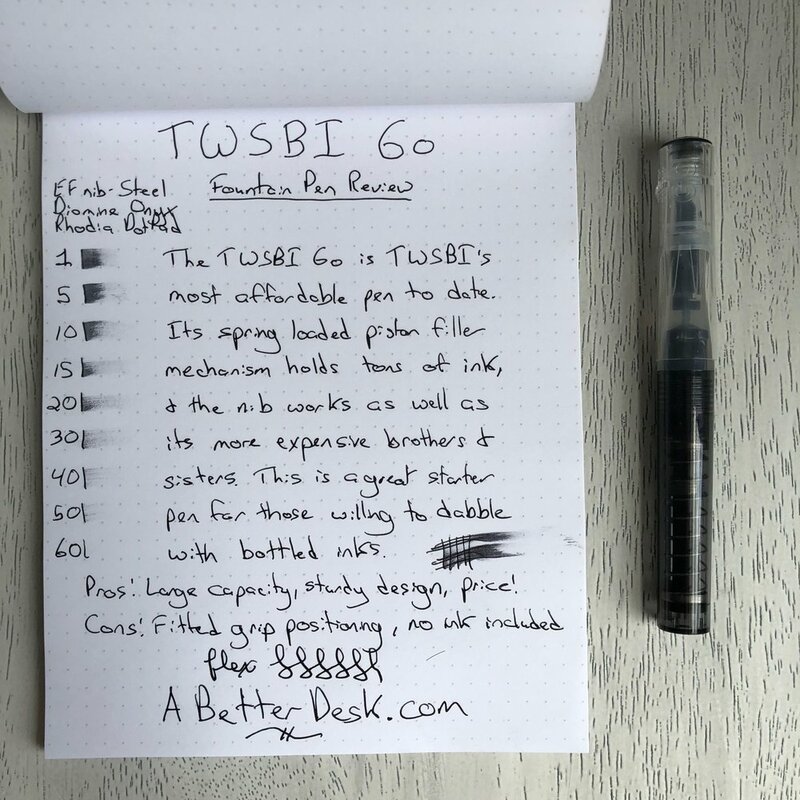 The TWSBI GO fountain pen offers many of the same benefits of other TWSBI pens, without the frills of its more expensive brothers and sisters. Most metal parts have been replaced with plastic, aside from the nib itself, piston spring, and ink chamber seal. The pen is still sturdy and well-built, and the heavy plastic helps it maintain a nice heft in hand. Most TWSBI pens have a twist-operated piston, but this has been replaced by a sturdy metal spring-loaded piston in the GO. It’s less finicky than a twist piston and won’t need to be greased every now and then, but it does give the pen a cheaper appearance. To fill the pen, dip it into your favorite bottle of ink and press the piston. The TWSBI GO is a bit thicker, so I did have some trouble getting it past the halfway mark in my smaller Diamine bottles. 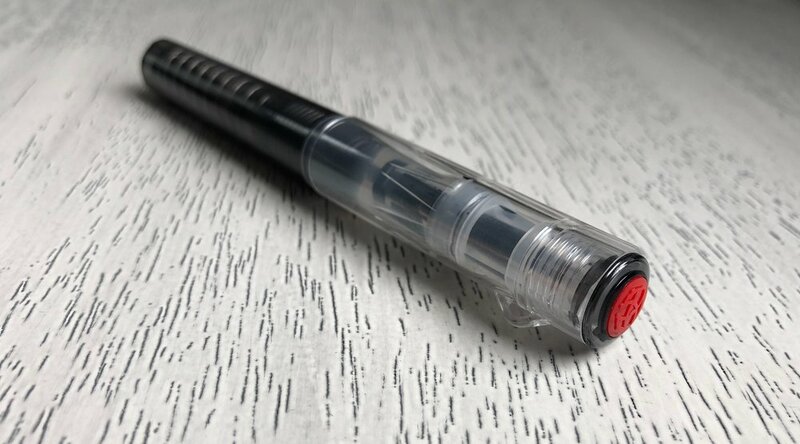 It turns out TWSBI has developed its own solution for this issue, but unfortunately, the GO doesn’t work with TWSBI’s easy fill mechanism in the top of its inkwells. You're just going to have to fill this pen the old-fashion way. TWSBI pens-or any piston fillers for that matter-aren’t designed to use ink cartridges. This might scare away fountain pen novices, but the huge ink capacity is worth the tradeoff, in my opinion. If you’re considering purchasing this pen as your first fountain pen, check out my Penventory page for ink recommendations. Diamine inks are a great place to start, since they perform well and are affordable. Although the TWSBI GO does compromise in certain areas, the nib writes just as well as any TWSBI nib I’ve ever used. I usually rely on F (fine) nibs but purchased an EF (extra fine) nib and have been very pleased with its performance. TWSBI nibs tend to run broad, like most European nibs, and are wet writers in most instances. I have to admit, I think I may prefer the EF nib to the F.
This brings me to my only true issue with the pen—its grip design. Most TWSBI grips are smooth, and slipperiness is something that comes with the territory. The TWSBI GO grip is tapered and smooth, except for a molded grip at the base of the nib. I typically don’t grip the pen this low, since its uncomfortable and tends to result in inky fingers, but the GO grip somewhat forces you into this position. I wish the grip design was either fully molded, like the Lamy Vista and Safari, or completely smooth, like the TWSBI 580AL. Instead of a clip, the TWSBI GO fountain pen comes with a keychain loop. If you absolutely must have a clip but want a TWSBI, try the TWSBI Eco. Personally, I like clip-less designs since I carry most pens in a Nock Co. Sinclair Pen Case. The pen also caps and posts securely and the cap relies on a snap mechanism, instead of a twist mechanism, so no need to worry about pocket leaks. Overall, the TWSBI GO fountain pen is a competent addition to the $20 and under category. 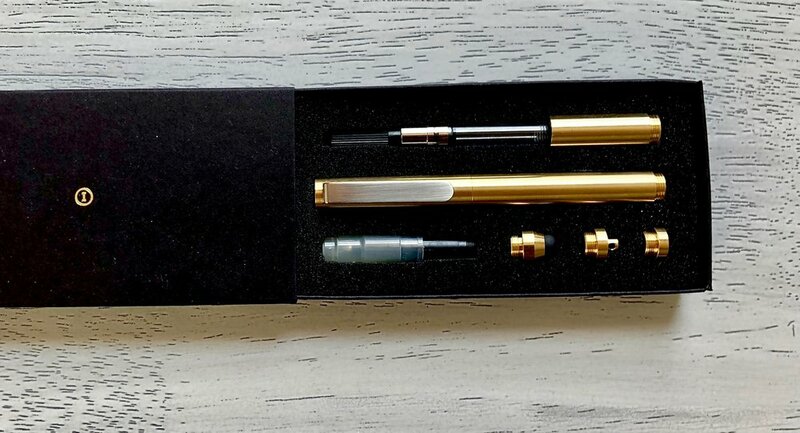 Those looking for an affordable piston filler will be hard pressed to find a pen that offers such a high quality writing experience for such a low price. Inventery’s Pocket Fountain Pen is a sleek and stylish modular pen that can be customized with a variety of caps and tips. At first glance, there’s a lot to love about this little beauty. The slim design has a smaller footprint than the Kaweco Sport, yet the sturdy brass body gives the pen a nice heft. The pen extends to full size by posting the threaded cap, and the cap posts and caps securely. I have large hands, and the posted pen rests comfortably in the web of my fingers. Pocket Fountain Pen with optional extender (top), Lamy 2000 (middle), Pocket Fountain Pen without optional extender (bottom). Attention to detail is key in taking on the established fountain pen brands and Inventery delivers. The body finishes and coatings are flawless, and the modular components screw smoothly into place and hold together firmly. The pen clip even aligns perfectly with the nib when posted. I have to take a moment to point out the pen’s modular cap system. It comes with four interchangeable cap tips: clip, keychain loop, stylus, and clip-less. My favorite tip is the simple clip-less, which gives the pen a stunning minimalist look. It’s simply one of the sleekest looking pocket fountain pens that I’ve ever seen. Speaking of clips, Inventery’s Pocket Fountain Pen clip is sturdy, although there’s an intentional gap between the clip and the cap body. I like the appearance, but it certainly won’t hold the pen in place like some of the tighter clips on the market. Personally, I have no problem carrying the little guy in my pocket without the clip attachment. Since it caps so securely and looks stunning without the clip, I find it worth the risk and have had zero issues. Okay, okay—design is great, but how about the nib? The pen comes with a Schmidt Iridium tipped nib (more geeky info on “Iridium tips” here). Overall, the nib is adequate, with a nice amount of flex for a steel nib, but some scratchiness on side strokes. Although the nib isn’t quite as special as the pen itself, it works well, and its few idiosyncrasies shouldn’t scare you away. Yes, a gold nib would be nicer, but I’d also feel much less comfortable carrying around a gold-nibbed pen loose in my pocket. Steel nibs are just so inexpensive to replace. I have to admit, the ballpoint tip sat in the pen box for several days. I tend to use fountain pens by default, but I swapped out the fountain pen tip for the ballpoint tip and was pleasantly surprised. It’s also a consistent writer and sits in the middle of wet and dry. When I’m not writing with a fountain pen, I’m writing with a Retro 51. This tip isn’t quite as nice as a Retro 51 Easy Flow refill, but for a pen that offers so much versatility, it writes nicely. The fact that the pen comes with both fountain pen and ballpoint tips makes it an easy recommendation for someone wanting to dip their toe into the fountain pen world. Even the packaging is stunning (shown with optional metal extender). All in all, the folks at Inventery have produced an extremely well-designed and customizable pocket pen that clearly succeeds in its attempt to be both sleek and functional. The price point is the only detail that gives me pause; however, I think that it’s a fair price when considering all of the included customizable components, excellent design, and the overall obsessive level of manufacturing quality. It even comes with nine ink cartridges to get you started. The nib is nothing to write home about, but the pen makes up for the standard nib in almost every other aspect of its design. 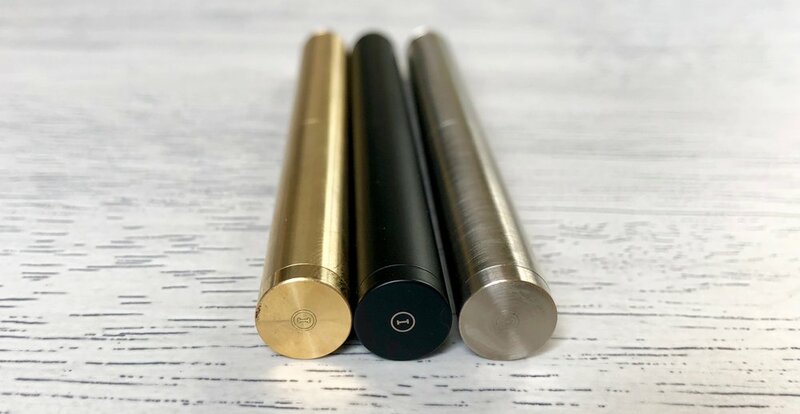 The Inventery Pocket Fountain Pen is available in three styles: onyx, brass, and brushed chrome, and all three finishes are stunners. There’s also an optional pen extender, which extends the length of the pens body by a cap-length or so, but I personally found it unnecessary, especially for $30. For full details on the Inventery Pocket Fountain Pen, check out the product page. The Inventery Pocket Fountain Pen was provided free of charge for the purposes of this review. I have to admit that I’ve avoided the Retro 51 Tornados for years. They always seemed overpriced, gimmicky, and large to me. During an occupational pilgrimage to Apple in California, I stopped by the Apple Store on campus and couldn’t resist the Apple edition of the Retro 51 Tornado Slim. 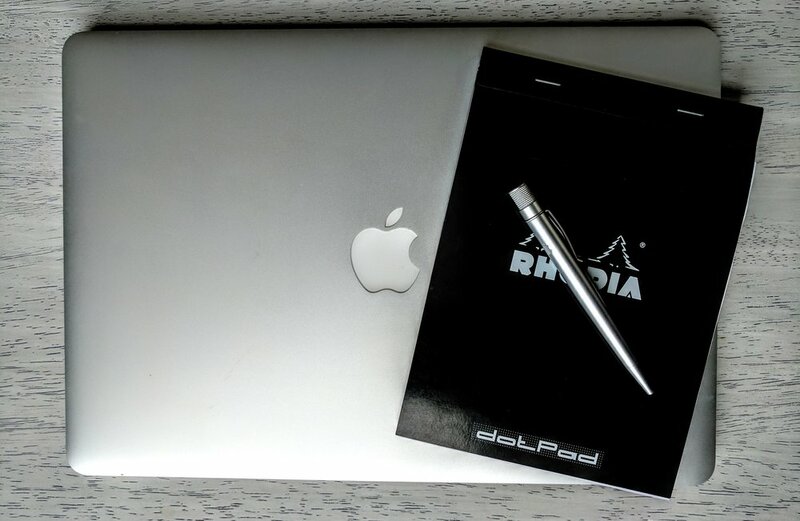 The pen was made with the same finish as the MacBook Pro’s at the time, and the slim design was much more comfortable to hold than its thicker counterparts. I loved the pen, using it daily for a year or two, until it mysteriously vanished (ok, I likely left it somewhere). I was heartbroken and immediately began searching for a replacement. I wasn’t thrilled with the limited choices in the Tornado Slim line, so I decided to give the full-sized pens a try. I stumbled upon the Retro 51 Torando Dr. Gray, a part of the Vintage Metalsmith line. While its stonewashed metal trim gives it a beautiful antique finish, the real star of the show is the pen’s barrel. A representation of the skeletal system, complete with labels, wraps around the white barrel. Dr. Gray references the well-known Henry Gray, author of the Gray’s Anatomy textbook (and yes, the show Grey’s Anatomy also references that actual Dr. Gray). The barrel also glows in the dark, and the effect is pretty slick when combined with the intricate skeletal system. 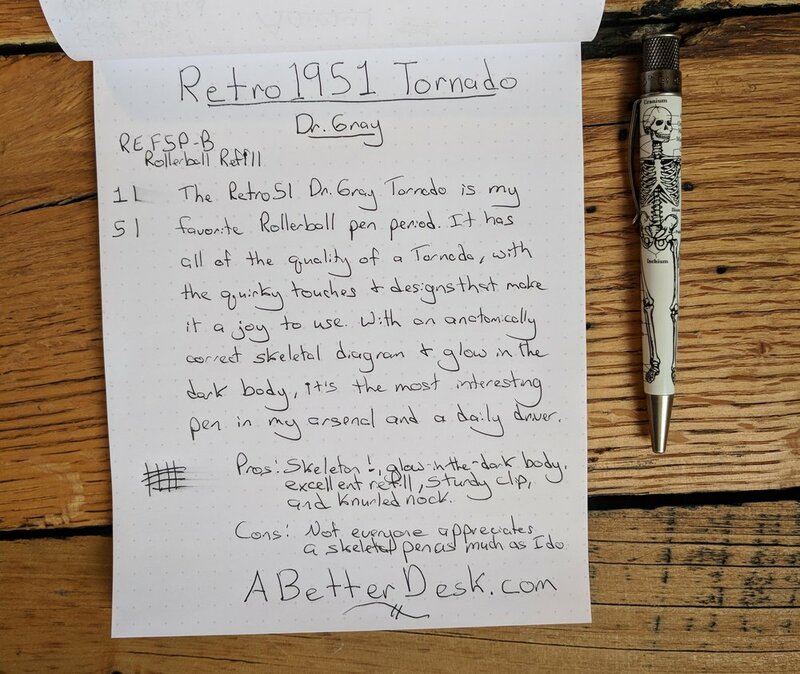 The Retro 51 Tornado uses a twist mechanism to expose the pen tip. The knurled design provides a grippy surface to twist, and the design visibly sets the Retro 51s apart from other pens. The writing experience is superb and, although I’m not an expert on rollerball or ballpoint pens, the Tornado refills are easily the best that I’ve ever used. If there’s one complaint that I have with the pen, it’s that it comes with the rollerball refill - REF5P-B. Although it’s a great refill, I much prefer the Easy Flow 9000 ballpoint refill - REF71-B, but it’s very easy to swap them. There’s just something about the ballpoint refill that ticks all of the right boxes for me and makes me miss my long lost Apple Tornado Slim. That said, the rollerball refill is still incredibly smooth but it tends to be a bit wetter and scratchier—counterintuitive, I know—than the Easy Flow 9000. The Retro 51 Torando Dr. Gray is my favorite non-fountain pen, and it’s easily the most-used pen in my pen case. Even when I don’t have my case with me, Dr. Gray is always in my pocket or on my desk. The design is whimsical, and the pen itself is incredibly sturdy and a consistent writer. Unfortunately, as of this writing, it looks like the Vintage Metalsmith Tornados are in short supply. Both Pen Chalet and Amazon have them in stock, but I’m not sure for how much longer. 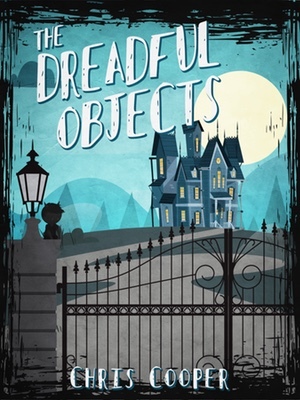 I wanted to post this review before they go out of stock, so if you’re at all interested, take a look soon!